I absolutely adore historical fiction. Well I guess I adore it if it's done properly and this book most certainly was. I don't read enough of it and I especially love young adult historical fiction. This book really had it all; intrigue, romance, and amazing period language and details. I adored both of the main characters, different as they were, and the plot and writing were spot on. It's so easy to make a lot of wrong turns in historical writing, but this book was simply lovely. This book is set in 1911 in the English country and tells the story of two girls, Charlotte and Janie. Charlotte is beautiful and rich, but feels stifled by her strict world. She is sick of the stuffy parties and constantly trying to live up to her mother's impossible expectations, and more than anything she wants to find real love. She doesn't want to end up saddled to a man she doesn't love because her mother feels he's appropriate for her. Janie works in the kitchen in Charlotte's home and is very hardworking and ambitious. She wants more out of life than the station she was born into. Charlotte enlists the help of Janie and wants desperately to be her friend. Janie takes a great risk in befriending her because the help is never to associate with someone of Charlotte's status, but they end up on an intertwined path together. They rebel against their societal norms and both grow together. It is basically a coming of age story for these two girls. I loved both Charlotte and Janie. They both come from completely different worlds, but manage to find common ground and form a bond that goes against everything their society has taught them. They are both such strong, loveable characters and I just can't get enough of that bravery and courage that both of them have in droves. Charlotte's mother is the epitome of what society was like back then. She is the perfect character to show the juxtaposition between Charlotte and Janie and what they should be like. Longshore manages to write two characters that are not only great role models, but also very relatable to modern young women. This is not any easy thing to do when writing in a historical time that might as well be a different world from today. Their story transcends time. The story and writing were also both wonderful. Longshore writes in such a way that it feels authentic to the time period, but also very easy to understand in today's language. She perfectly balances authenticity with clarity in her writing. She also writes with wit and clearly chooses her words carefully. The pacing of this book was perfect, which is so important to any good story. And as far as the plot goes there is the perfect balance of romance and intrigue, while also a great deal of importance placed upon Charlotte and Janie's friendship. The plot is filled with twists and turns that keep you both riveted and interested. I love that romance was a big part of this story, but the friendship was at the center of the story. Too many books today place too much importance on romance and not enough on friendship. This story was right on point with balancing the two. 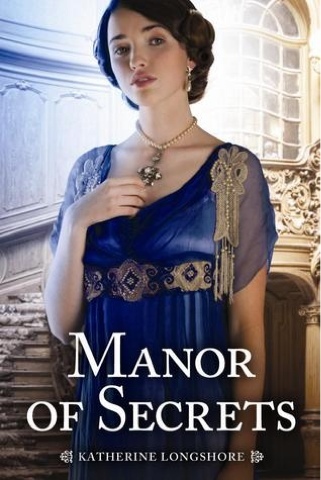 Manor of Secrets was a quick read. It had me hooked from the very beginning and I finished it in just a couple of days. For me it is exactly how young adult historical fiction should be done. It had a satisfying ending and as far as I know it is a stand alone novel, but I want more! I hope Longshore writes more historical novels like this one. I am willing and ready to read anything she comes up with next. I'm giving this book 5 out of 5 stars because I honestly cannot think of a bad or negative thing to say about it. Read it. You will love it. It really has everything you could possibly want in not just a historical young adult book, but any kind of young adult book in general. I cannot wait to read what Longshore writes next.